One convenient place to stop and get information on Lincoln and North Woodstock	NH, Franconia Notch State Park, and the White Mountain National Forest. Drop in here for National Forest information, lodging and dining tips, local maps, simple trail maps, camping guides, and the latest weather reports. White Mountain Attractions (tel: 603-745-8720) and the Lincoln-Woodstock Chamber of Commerce participate in the Gateway Visitor Center. 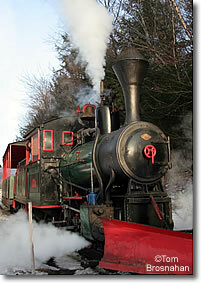 Steam locomotive, Loon Mountain, Lincoln NH.